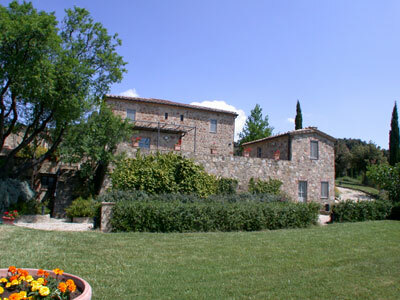 Villa Oliveto (240 sqm) is as close to the universal dream of a perfect Tuscan country retreat as could be found. Set amongst this haven of natural tranquillity and beauty, surrounded by 25 hectares of vineyards producing the marvellous Brunello wine, these are charming stone-built houses, approximately 11 kms from Montalcino, that have been lovingly restored. Podere Oliveto consists of the main farmhouse and a delightful adjacent cottage annexe for four people. Both houses are perfectly restored to a very high standard keeping all the original features, and using, wherever possible, original materials. The properties are elegantly and tastefully furnished with a comfortable mix of antique, modern and traditional Tuscan country styles. The property is reached by approx. 500 m of unmade track. Villa Oliveto is set amongst a haven of natural tranquillity and beauty, surrounded by 25 hectares of vineyards producing the marvellous Brunello wine.